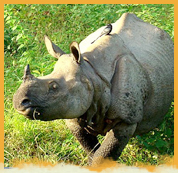 One of the most vulnerable species of mammals, found only in Northern India and Southern part of Nepal, the Indian Rhino is the largest of three varieties of Asian rhino. Unlike its relatives in Sumatra, Zava or Africa, the Indian rhino is the only species of rhinoceros which has one horn. By the grace of nature two third of its total population is available in India’s north-eastern state of Assam. While the physical appearances of these massive animals are terrifying, nature wise they are very generous. However, they are not very clever and love to roam alone. This is the reason why poachers can track them very easily and kill them for their highly valuable horn and skin. The rhino is an armored animal that has a very hard skin that can withstand major attacks from sharp weapons like sword. The skin colour of this sub-species varies from brownish to grey. The Indian rhinos have wart-like bumps around their shoulders, neck and legs. The main attraction of this species is the hairy hard horn-like element that grows above their nose. This horn can be about 20-60 m long and has a grey-brown colour. A full grown rhinoceros may weigh up to 2200 kg and their length may reach up to 12.5 ft. It has striking resemblance to the Javan rhino but can be distinguished for its massive skin folds. The Indian rhino has a poor eye sight, but they have a very powerful hearing and sense of smell. During the mating season they find out other rhinos through their enhanced sense of smell. Rhinoceros are mainly grass eaters. They love to spend time in riverine grasslands and floodplain areas. As a result they get enough of fruits, branches of trees, and shrubs to eat. Occasionally they love to eat aquatic plants as well. To save themselves from mid-day heat the Indian rhinos have their food early morning or in the evening. The female Indian rhinos become mature at the age of 5-7 years old and males achieve maturity at around 9 years. Females can bear calves at 6-8 years. Gestation period for the Indian rhinos is 16 months. At the time of their birth, the baby rhinos weigh up to 160lbs and they can walk shortly after their birth. Males fight with other competitors to mate with their desired female and the winner of the battle get the chance of mating. Indian male rhinos are not very social. They leave their mother at 1 year and start living alone. They are mainly of solitary nature. Females stay together with their offspring and feed them. Breeding goes on throughout the year and there will be a gap of one to three years between the calves. They love to live in swamps and muddy areas. During the scorching summer, rhinos immerse themselves in ponds, rivers and muddy hollows. They can move very fast, so much so that it has been clocked that they can run at a speed of 48km/hour. Moreover, they can jump or change their direction very quickly.